Flowers are extensively used by almost all people in many occasions. We send charming and beautiful Flower Bouquet to friends and relatives to express our Love. 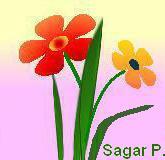 Flowers are also used during Diwali -festival of Happiness and Joy.